This is the ultimate tool for any coach looking to train a player to be a libero. Kevin Hambly has created the perfect video to teach the role and skills of the libero to coaches, parents and athletes. Coach Hambly breaks down the role of the libero, explaining the importance of footwork, using your center of gravity, making a correct platform, moving around the court and keeping your distance from the net. Coach Hambly talks about coverage, the role of the libero on a team, and how to identify the best player for the libero position. He covers every aspect of being a libero in easy to understand segments that are easy to understand and master. As he moves from skill to skill, Coach Hambly has his experienced players show how it is done and then he brings in younger players who are being taught the skills for the first time. He actually teaches these young players on the spot and then shows how to correct some parts of the movements with them until they are doing everything correctly. Time and again Coach Hambly emphasizes that coaches teaching skills should allow for singular focus during drills and players wanting to achieve advanced skill levels must put in the time to get the high number of reps to reach their goal. 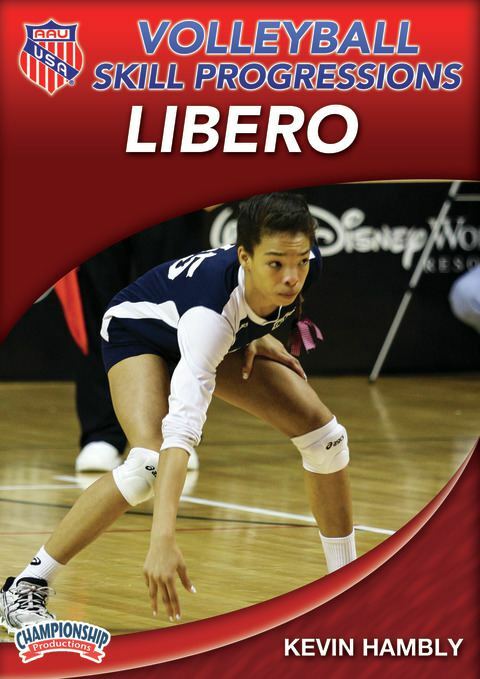 This DVD will help you identify a player in your system who would best fit the libero role and it gives you all the skills to train her/him properly.